Our company is licensed to perform project works "Process solutions" including process regulations development, installation drawings development, construction task distribution, working out the drawings for non-standard equipment using the equipment of our enterprise. We are ready to analyze the suggestions for manufacturing non-standard equipment with drawing development or according to customer's drawings. We offer development and implementation of optimal process solution to support all key business processes with regard to your requirements, company size and budget. If your company is engaged in production of construction equipment and you want to enhance the effectiveness of your activity by means of using modern engineering solutions we offer the development and implementation of an optimal engineering solution to support all key business-processes with regard to your requirements, company size and budget. This standard typical scheme can be used for heat drying of bulky construction materials: lime-stone, sand, gypsum, etc.) (hereafter referred to as – the material) with initial moisture up to 20%. The material shall not be inflammable, explosive or chemically active. Preliminary crushing department is recommended to use in case the raw material lump size is more than 60 mm. 1.1. Material is supplied to crusher (pos.2) by feeder (pos.1). 1.2. Material grinding is performed in the crusher (pos.2). 1.3. Crushed material by elevator (pos.3) is supplied from the crusher (pos.2) into the wet material storage hopper (pos.4). 2.1. Material is supplied to conveyor (pos.6) from the wet material storage hopper (pos.4) through slide gate (pos.5). By adjusting the size of a slide gate slot (pos.5) it is possible to adjust the material supply to conveyor (pos.6). 2.2. Material is fed by conveyor (pos.6) to drying cylinder (pos.8) for heat drying. 2.3. Material drying is performed by drying gases supplied from heat generator (pos.7). 3.1. Dust laden drying gases outgoing from the drying cylinder (pos.8) by gas duct enter for cleaning from dust into the aspiration department which consists of two-stage cleaning system. 3.2. 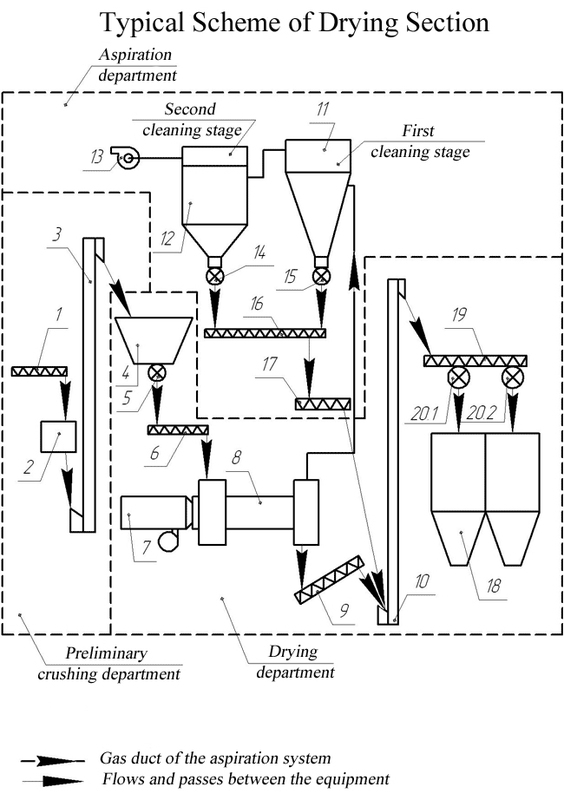 The first cleaning stage includes cyclone (pos.11). Treatment efficiency is up to 80%. 3.3. The second cleaning stage includes sleeve filter (pos.12). Treatment efficiency is 99,9%. 3.4. Movement of outgoing drying gases through two-stage treatment system is effected by draught machine of a DN type (pos.13). 3.5. Filtered dust from the first and second treatment stages through unloading mechanisms (pos.14 and 15) enter the conveyor (pos.16). 1. Feeder. Feeder type is to be determined by Customer according to the check list. Approximate length – 5 m. The exact length is determined at the design stage after creation of general layout. 2. Crusher. Type of crusher is determined by Customer according to the check list. 3. Elevator. Elevator type is determined by customer according to the check list. Approximate length – 15 m. The exact length is determined at the design stage after creation of general layout. 5. Sliding gate. Type of sliding gate is specified by customer according to the check list. 6. Conveyor. Type of conveyor is specified by customer according to the check list. Approximate length – 5 m. The exact length is determined at the design stage after creation of general layout. 7. Heat generator. Heat generator is to be selected after having thermotechnical calculation. 9. Conveyor. Type of conveyor is specified by customer according to the check list. Approximate length – 5 m. The exact length is determined at the design stage after creation of general layout. 10. Elevator. Elevator type is determined by customer according to the check list. Approximate length – 25 m. The exact length is determined at the design stage after creation of general layout. 11. Cyclone. Brand and a number of cyclones is to be determined at the design stage after having thermotechnical calculation and depends on outgoing gases volume from the drying cylinder considering the theoretical intake of supplementary air. 12. Sleeve filter. Brand and a number of sleeve filters is to be determined at the design stage after having thermotechnical calculation and depends on outgoing gases volume from the drying cylinder considering the theoretical intake of supplementary air. 13. Draught machine of DN 1 type. Brand of a draught machine of ВТ type is to be determined at the design stage after having thermotechnical calculation and gas and dynamic calculation of gas exhaust tract and depends on outgoing gases volume from the drying cylinder considering the theoretical intake of supplementary air. 14,15. Discharge mechanisms. Type of discharge mechanisms is to be determined by customer according to the check list. Quantity of discharge mechanisms depends on a quantity of cyclones (pos.11) and sleeve filters (pos.12). 16. Screw conveyor of G1-20-16P type. Approximate length – 15 m. The exact length is determined at the design stage after creation of general layout. 17. Screw conveyor of G1-20-16P type. Approximate length – 5 m. The exact length is determined at the design stage after creation of general layout. 18. Dry material silo. Volume and quantity of silo is to be determined by Customer according to check list. 19. Screw conveyor. Standard size of a conveyor is to be determined basing on the required efficiency. The exact length is determined at the design stage after creation of general layout. 20. Parallel-slide valve. Type of a parallel-slide valve is to be determined by Customer according to check list. Quantity of parallel-slide valves is to be specified by a number of silo.